Apparently, there is a lot of hoohah involved when it comes to booking a large table at a decent restaurant in London. We had a big reunion dinner at Hakkasan Hanway Place, with some of my university friends, and some old friends who had moved over to London from Asia, as well as PB, who came in on the Eurostar for one day of fun in the big smoke. It was a fun group, and Hakkasan is a cool place to have a good meal and a good time. The last time I visited Hakkasan, it was to their Mayfair branch, which I feel has a much cooler vibe with it’s trendy bar upstairs, packed with beautiful people, bankers and one guy who was so snobby and full of himself that we (two girls) didn’t know whether or not to take him seriously or to laugh out loud. 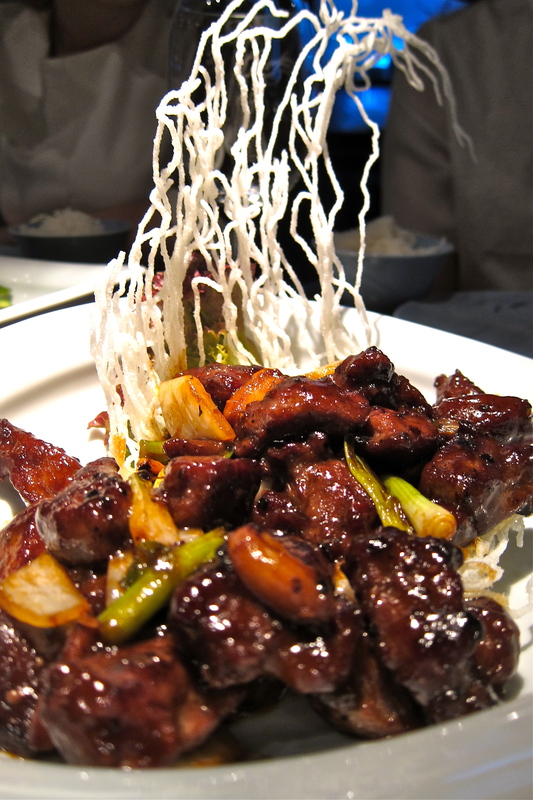 Hakkasan Hanway Place is the original of the two Hakkasan restaurants in London. After descending into the dark and vibey restaurant via a black, scented staircase, you’re greeted at the bottom by the welcoming and well-dressed staff. From the entrance it looks quite swanky, but once you enter the dining room, it almost has a canteen feel to it. The décor hasn’t changed since it’s opening in 2001, and it is looking rather dated. We were offered a selection of set-price ‘Signature Menus’, a must for large parties. The reservation (and the menus) had to be confirmed at least 48 hours in advance, and any cancellations after this time would be subject to a £40 charge! 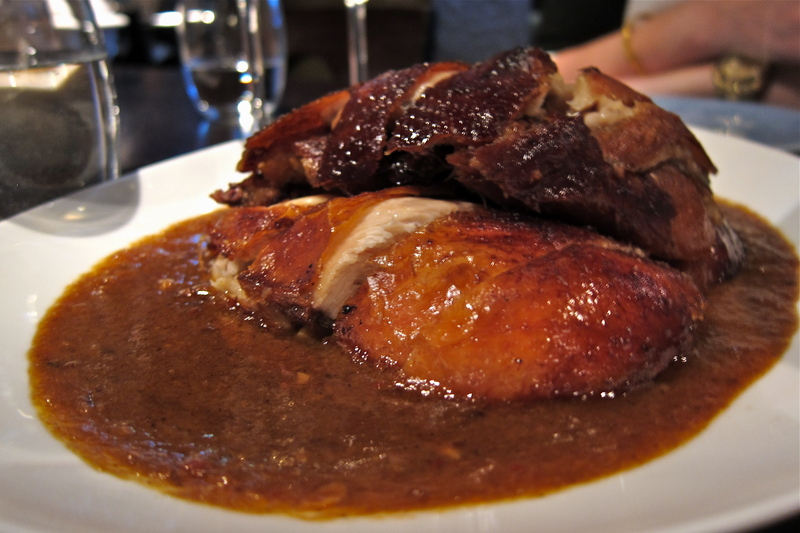 We went for the £60 menu, featuring dim sum, main dishes and dessert. It was actually a huge amount of food, and I felt bad that quite a bit of it was wasted – I certainly ate my fill! 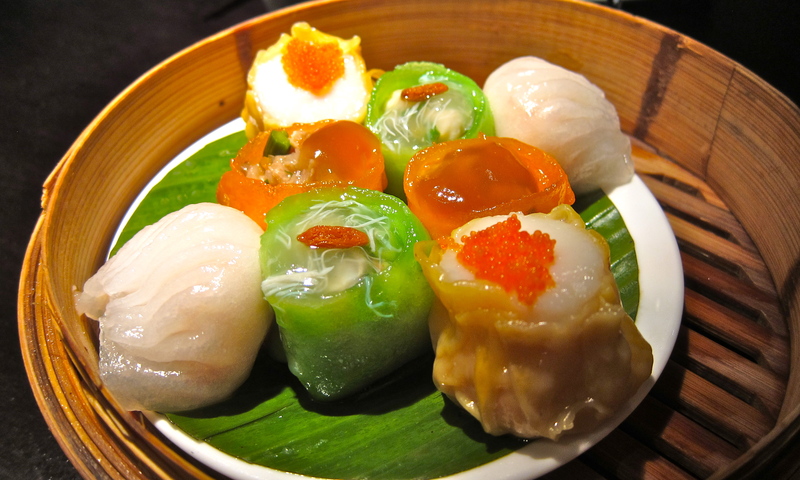 The dim sum selection featured your usual har gau, scallop siu mai and two different from your average dim sum options, a Chinese Chive Dumpling and Shimeji (mushroom) Dumpling. 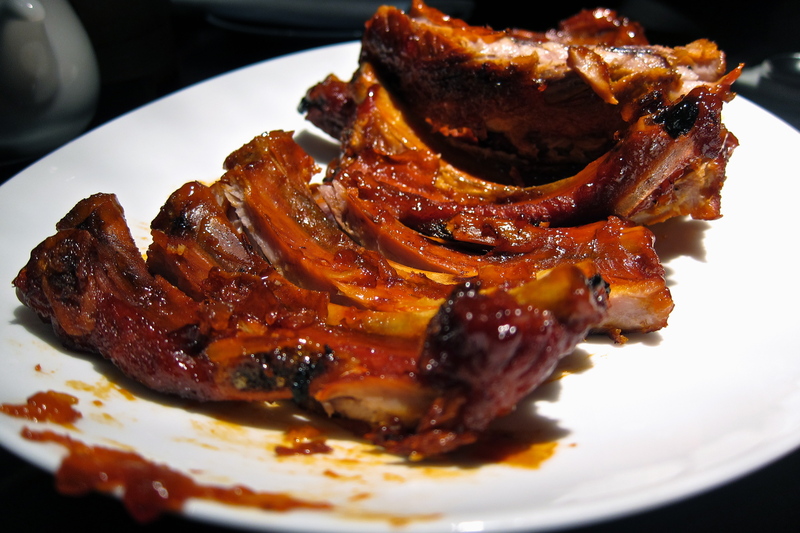 Also under the ‘small eats’ section were the Jasmine tea-smoked organic pork spareribs. The sauce was okay but the spare ribs were not tender and didn’t have much meat on them. The rack was served whole and then sliced messily and rather unceremoniously at the table. The stir-fried black pepper rib eye beef with merlot was the best thing on the menu, tasty, tender cubes of high quality beef in a black pepper sauce, which was subtle and wonderful. I was popping piece after piece into my mouth far after reaching capacity! The pan-fried silver cod was also excellent. Sure, it was a dish that you could find on any Hong Kong menu, you get fish and you fry it. But rarely do you find silver cod deep-fried in a Chinese restaurant, and herein lies the special-ness of this dish. Lovely, thick slices of cod, flash fried and served with a nice umami sauce. 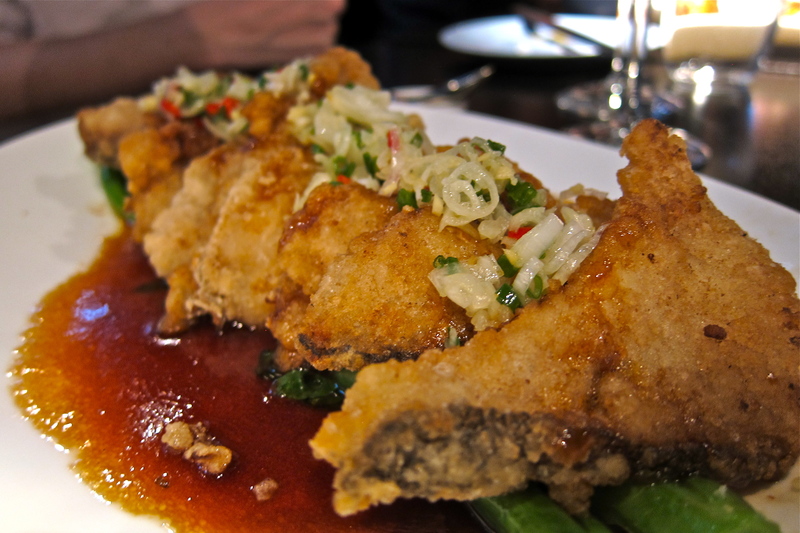 Then fish is laid upon a bridge of choi sum, so that the fillets don’t get soggy – a thoughtful touch. 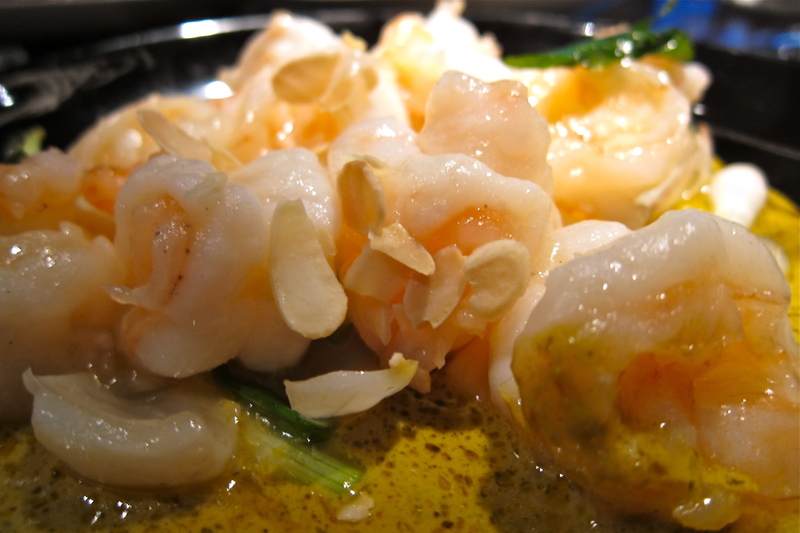 The Spicy Prawn was really tasty, with huge, juicy prawns in a slightly spicy and smooth curry-esk sauce. This dish is more than worth it for the amount of prawn that you are given, although I’m not sure if this is the same size as a normal portion. 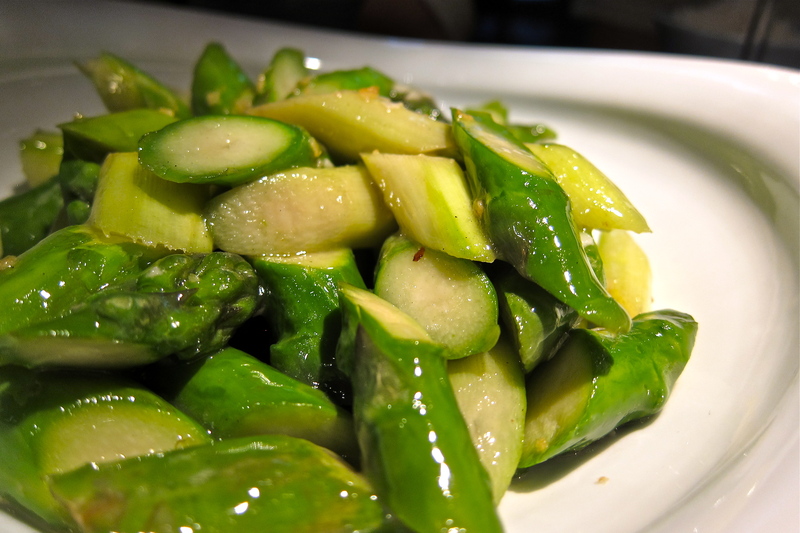 The asparagus were very nicely cooked, vibrantly green with a nice crunch. I didn’t even try one piece of the Roast Chicken in Satay Sauce. First of all, the sauce was a bit off-putting for me – it certainly wasn’t the best looking dish on the table. That, and the fact that it was placed the furthest away from me meant that I didn’t get around to it – I was far too consumed with the black pepper beef right in front of me. We were also served desserts, but by this point we were stuffed to the gills, and there was so much catching up going on that at some points, I think we forgot to eat what was in front of us! The bill came to £120 per person, including a magnum of Roederer Champagne, and four bottles of white wine between the 10 of us. I thought that was reasonable for the amount of food and drinks that we had. The restaurant closes at 2.30am, allowing us to continue chatting well after we finished our meal, finally leaving at 1am. Whist I wouldn’t say that the food deserves a Michelin star, we had a great evening there! And for those who will make fun of me for going all the way to London to eat Chinese food, it’s not fully authentically Chinese, so there are still some different dishes to be had.